If I obeyed even when it didn’t make sense, He would never let me down. Eric and Leslie’s love story captured in novel form! 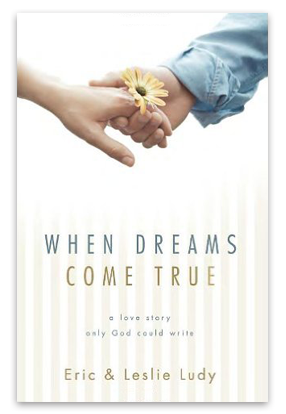 This is a refreshingly real, true-life account of Eric and Leslie’s own journey through the struggles and triumphs of discovering a God-written romance. It will encourage, motivate inspire you and build your faith that dreams really do come true when the Author of romance holds the pen. Whenever anyone says to us, ‘So tell us about your love story’ we tell them to read When Dreams Come True. Our love story, in our humble opinion, was (and is) one of the most amazing in the history of the world. Not because of our own romantic ability—rather, because God Himself scripted the details. All of the struggles, doubts, hopes, fears, failures and triumphs of our relationship are captured in this book. During our single years and throughout our love story, Leslie and I both kept detailed journals, which we drew from when putting this book together. As a result, this story provides an intimate peak inside our hearts and minds during the process of building a God-written love story. It’s written like a novel, but the story is true. If you want a clear example of what a Heaven-built romance can look like, this is the book for you. If you have ever struggled with the idea of giving God full control of this area of your life, this book will offer you a refreshing vision of hope. This book is great for readers of all ages.